I love the way Ethan is so expressive with his hands. When he's laughing, he'll retract his balled-up fists to his chin. 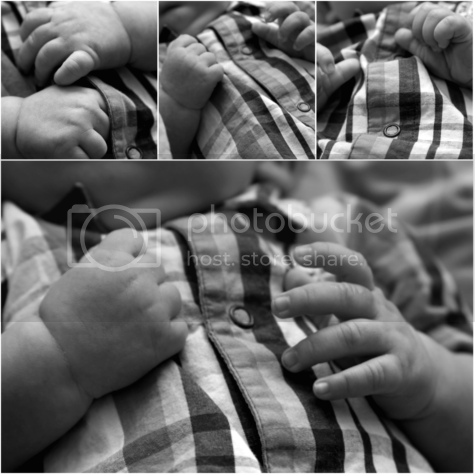 When he's upset, he'll stick his pinkies out of an otherwise closed fist and hold them even with his shoulders. 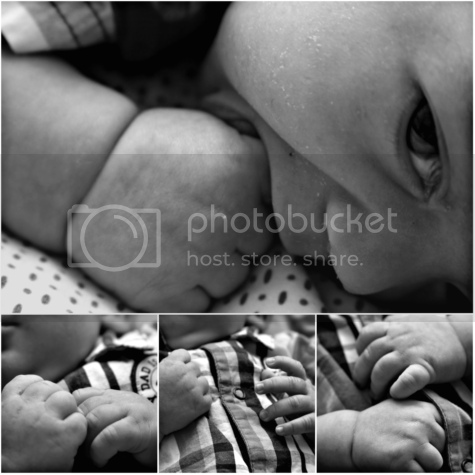 He is constantly swinging his palms around, exploring (and tasting) his fingers and watching his hands open and close. When he is hungry, he is still with his hands and barely lets his limbs move. When he is taking a bubblebath, he will wave his hands up and down, exploring the bubbles with his fingers and causing little droplets of water to splash up onto his face. When we are laying on my bed and singing songs, he is a mess of flailing arms and legs as if he just discovered how to move them and wants to bask in the miraculousness of having control of ones limbs and feeling them fly through the air. My favorite is when we're playing tummy time and he's holding his head up until something -- the sound of my voice, a cat hopping up onto the bed -- amuses him so much that he erupts into a fit of smiles and coos. He gets so excited that he tries to flail his arms around while they're tucked under his tummy and ends up collapsing onto the blanket, face down on the mattress in defeat. Once he turns his head to the side after his little mishap, he's still smiling. Always, without fail, he is still smiling. I'm a huge fan of Hushabye Baby. You may remember my many posts about never leaving the house without my Johnny Cash lullaby CD. It traveled with me from our home CD player to my car to Ethan's grandparents house. Wherever we went, it went. I was getting awfully good at busting out the words to "If I Was A Carpenter" on the regular when Ethan started to get a bit fussy in the backseat. When Hushabye Baby gave me the opportunity to review another one of their albums, I was elated! I chose Taylor Swift. Most people would probably be surprised to find so many Taylor Swift albums in my CD collection, but we're all entitled to our guilty pleasures, right? Truth be told, I started listening to a lot of Taylor Swift when I was pregnant. I wouldn't be surprised if Ethan's first words were the chorus to White Horse. 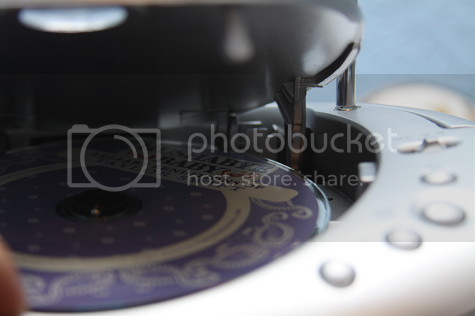 When the CD arrived in the mail, we popped it into the CD player. I strapped Ethan into the Ergo and we danced and sang one song after the other. He was fast asleep in no time. I found myself so in love with the soothing melodies of this CD that I was admittedly listening to it on my solo car trip to Walmart the other day while my husband was watching Ethan. It really is quite peaceful and beautiful! Even the more upbeat songs like You Belong With Me are turned into these quiet, soothing instrumental lullabies. 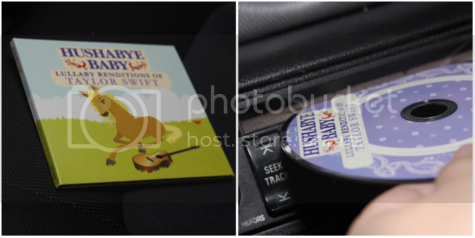 In addition to Johnny Cash, I'm now carrying around Taylor Swift with me, too. At home, in the car, at naptime or bedtime or just to relax during feedings, we're always playing our Hushabye Baby albums. These are my favorite lullaby albums because while soothing for baby, they're also pretty awesome for mom and dad, too. They make for great lullaby songs to sing to baby, too. I mean, be honest, do you really know the words to Brahm's Lullaby?! Hushabye Baby doesn't just stop at Taylor Swift and Johnny Cash. There are 10 different country artists to choose from ranging from Willie Nelson to Rascal Flatts, all in lullaby form. Each CD has 10-12 full-length songs on it like an actual CD so it's perfect for fussy babies taking a while to go down and nap or long car rides. Many children's lullaby CD's only have half the number of songs that Hushabye Baby albums have and I'm sure we all know the maniacal feeling of hearing those same lullabies over and over again and wanting to toss the CD out the window. No? Just me? Either way, it's a wonderful change of pace to not feel like you're stuck in Groundhog Day when listening to these fun, creative lullabies. In addition to the beautiful music, the album art is adorable. There is a little story to go along with each of the animals adorning the covers of these albums on the inside, filled with bright colors and cute illustrations for kids to look at. As I pack my stuff up for a morning drive and coffee date with Ethan's grandpa, you bet Taylor Swift was the first thing I was put into my diaper bag. We are hooked on Hushabye Baby. And now you can be, too! Hushabye Baby is offering one of my readers a chance to win a Hushabye Baby lullaby album of their choosing! Visit Hushabye Baby's website and tell me which lullaby album you'd pick if you win! Like Hushabye Baby on Facebook and leave me a comment with your name (first name, last initial) or URL so this can be verified! Leave Hushabye Baby a Facebook comment and let them know you've entered the giveaway at YouAreTheRoots.com! Follow Hushabye Baby on Twitter and leave me a comment with your username so this can be verified. 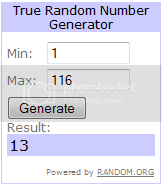 Giveaway ends 9/14 and is open to US residents. Winner will be selected at random and notified via e-mail! Congratulations! You've been notified via e-mail! This morning I excitedly took Ethan over to the pet store to look at the fish. I figured he'd get a kick out of looking up at the great wall of fish tanks filled with lights, vibrant colors and tons of different fish swimming around. It was an indoor and air-conditioned alternative to a zoo or aquarium which isn't happening during these brutal Florida afternoons. He was awake and happy until we pulled into the parking lot which is when he, of course, began his only nap of the day. It began to rain while we were inside so I pushed my slumbering baby in his stroller up and down each aisle to wait out the rain and in hopes he'd wake up to check out the fish. The cacophonous birds startled him a few times but he never woke up. It was still raining. The cashiers were bored and constantly asking us if we needed help. Unless they could miraculously make my infant son interested in the fish or make the rain stop, we didn't. I passed by the hermit crabs and stopped to admire them for a bit. 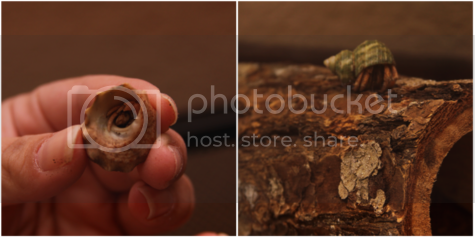 Hermit crabs are some of my favorite animals and ones I've always had as pets since I was a little girl. After my last hermit crabs passed away when I was halfway through college, I needed to give my heart a bit of a rest. I looked down at sleeping Ethan and thought it was about time he had his first pair of hermit crabs. Before I knew it, we were stocking up on tank substrate, a thermometer, an under the tank warmer, some spare shells and other crab necessities. I saw two itty-bitty little hermit crabs mixed in with a tank of larger crabs. Those were them. Those were Ethan's new hermit crabs. We named them Malachi and Mordecai. With Ethan in the Ergo (he woke up the second we pulled into our neighborhood, of course), we assembled their habitat. We laid down the substrate and misted it with water to hold in the humidity. We turned on the tank warmer. We laid some blue sand one one side of the cage for an "ocean" affect. We set up a freshwater drinking pond and a saltwater bathing pool. We shredded up some fresh lettuce for Malachi and Mordecai to eat. Mordecai is a bit shy. He likes the lettuce and the saltwater bathing pool but doesn't so much fancy being held. Malachi is much more adventurous. He is loving exploring his new digs. I'm not sure why I decided to be masochistic enough to bring in two new lives into the picture as that's probably not what most moms to infants would do. But if it means snuggling up with Ethan and reading A House For Hermit Crab at bedtime, then it's worth every second of it. Welcome to the madhouse, Mordecai and Malachi. I live for the citrus-y scent of Ethan's "Overtired and Cranky" bubble bath by California Baby. The scent of tangerines and chamomile manages to fill not just the bathroom but the entire bedroom and side of the house. The calming aromatherapy works wonders on bringing forth sleep and relaxation on me, too, as I bathe Ethan. I feel rejuvenated. He mostly just likes the bubbles. He's getting to that point where he'll tolerate the tub in general but will give in and crack a smile or two when we get to blow bubbles with the included bubble wand. The bubble wand comes in handy, especially when taking his mind off of trying to eat the bubbles. It's his newest quest to eat every last cloud of bubbles in the tub. Is there anything better, really, than a freshly bathed baby? All bundled up in a warm, fluffy towel? I gave Ethan his post-bath lotion massage as he giggled and told me stories in his oh-so-cute baby talk. I picked him up and headed down the hallway to put on a fresh diaper and his pajamas. "Here he is, squeaky cl--" The words didn't even finish fleeing my mouth when a mass outpouring of baby vomit dared me to forget that Ethan was a reflux sufferer. Maybe reflux only seldom wins but, oh, it was doing a victory dance at this very moment. I felt the sticky vomit cling to my hair and run completely down my back. The sound of vomit hitting the tile and forming puddles around my feet managed to undo any peace and tranquility the bubble bath instilled in me. Lovely. Ethan himself was completely soaked in sticky puke. "Back to the tub," my husband acknowledged. Yes, yes we were. After round two, when Ethan was smelling fresh and new and baby-like again, we walked back out into the hallway. We passed by my husband who was busy mopping the puddles of puke from the tile. I was just about to lay Ethan down on the changing table when I felt it. This time it was pouring down my front. The little monster had opened the floodgates and began peeing all over me. I was standing in a pool of pee this time, clutching a baby who apparently just didn't want to smell like sweet orange and chamomile. He was feeling too rugged for that. I was feeling the pee seep into my clothing and the vomit harden in my hair. No amount of aromatherapy could undo the sheer yuck of the moment. None. Once mopping Ethan's bedroom floor was complete, my husband took the baby from me and encouraged me to shower. Showering -- the wish-upon-a-star be-all-end-all of "mom luxuries" -- had never seemed so luxurious. I was waving my white flag on this one. But somehow once I had finished showering, he turned into a perfect angel again. Ethan recently had the opportunity to review an outfit from Growing Up Wild, a fantastic organic clothing shop for babies! Kelly, the owner of Growing Up Wild, happens to make the cutest baby clothes I think I've ever seen! The fact that all of her items are so good for the environment and your baby make them even greater. I had the toughest time deciding which outfit we should go with but ended up deciding on an adorable octopus onesie and matching crib shoes. Go ahead, take a second to recover from the cuteness. I know, it's so cute it's nearly overwhelming! Where do I begin to describe my absolute love for this outfit and store in general? The organic material is so light and airy, making it extremely breathable in the hot Florida weather. 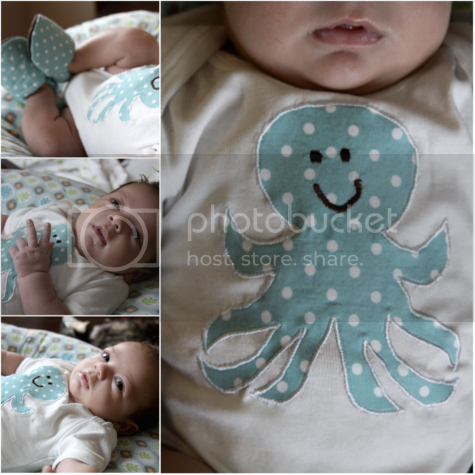 The oh-so-adorable octopus design is one of a kind...literally! Kelly of Growing Up Wild draws each design free hand so they all vary slightly. That little bit of personal touch is something that I love about Growing Up Wild! Everything from her shop is made with love and different from the one before it. As I mentioned, the onesie itself is made from organic cotton. 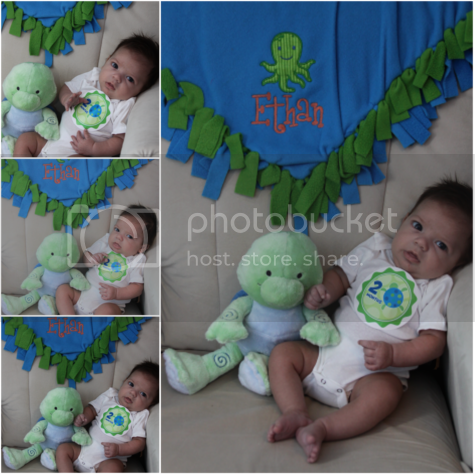 The onesies are so soft and gentle against baby's skin! 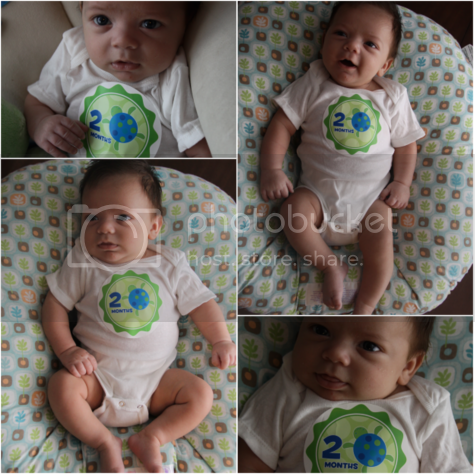 Even the onesie snaps are nickel free to avoid any potential allergic reactions with your little one. You're able to choose long sleeves or short sleeves and we, obviously, chose short sleeves to get us through this Florida summer! Not only did the onesie come soft and cuddly, but it smelled fantastic as well. All of the clothing from Growing Up Wild come pre-washed in all-natural, non-toxic soap and arrive ready to wear! As I was dressing Ethan, I also noticed that the tag was ironed in instead of being an actual tag. This is something I'm so grateful for as clothing tags can be so irritating on the back of baby's neck. The crib shoes were too cute for words and I was so surprised and pleased to learn they are able to grow with baby. They have elastic in them that you're able to pull tighter or let out to fit baby's growing feet and ankles. I'm excited to know that Ethan will be able to wear these shoes for some time as he grows since they can be let out to grow along with him! The shoes, too, are made with GOTS certified organic cotton and eco felt soles from recycled plastic bottles. The lining is made from organic sweatshirt fleece, making the shoes so soft and cozy on Ethan's little feet. They, too, are made by hand and with lots of love. HOW TO BUY: You can shop for your own little ones by checking out Growing Up Wild's Etsy store. Also be sure to add Growing Up Wild on Facebook for the latest news and deals! Growing Up Wild has also offered You Are The Roots readers a chance to save 15% on your next order! To take advantage of this great deal, you simply enter the code YOUARETHEROOTS upon check-out! This offer is valid until September 30th, 2011. 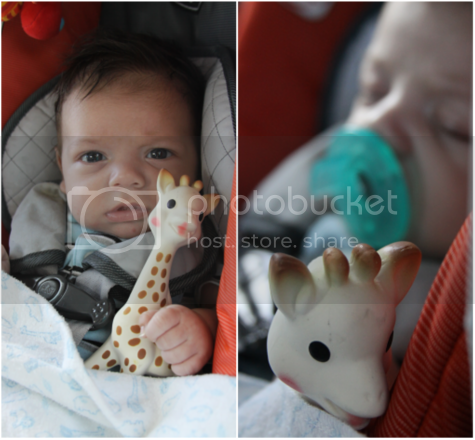 Yesterday Ethan had his two month check-up with his pediatrician. In the days leading up to the appointment, I had been eager to learn how much he has grown but dreading the shots he was going to receive. Ethan weighed in at 11 pounds, 14 ounces (almost twelve pounds?! Where did my baby go?!) and 23 inches long. That puts him at the 50th percentile for height and the 53rd percentile for weight. Now that his reflux is fully under control, he's getting oh-so-adorably chunky! The nurse brought in the tray of vaccines, complete with little bandaids ready to be applied over the "ouchie spots". I started crying before Ethan did. 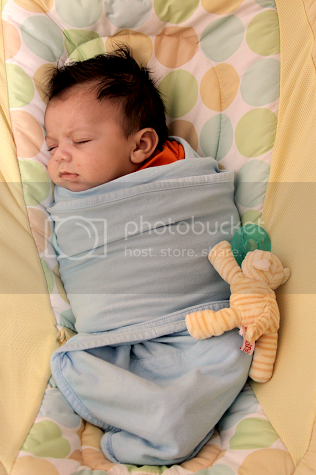 Ethan had stopped crying and was perfectly content by the time he was strapped back into his carseat ready to head home. (Note: I said Ethan had stopped crying by that time. Not me. I'm still have a ways to go in becoming a strong, unwavering mommy.) He survived the night without any fevers or adverse reactions save for a little grumpiness and discomfort. He needed a few more cuddles (which is nothing I can complain about) and his WubbaNub to make him feel better but eventually he did. This pediatrician visit also gave him the all-clear to make his way into public places for the first time since birth. I had been thinking of exciting places that would be suitable places for his first time out in public; places that would look really cool when written in his baby book. Life had other plans and I ended up taking him to the grocery store to pick up a couple of things we needed for dinner. Passerby smiled and asked how old he was and complimented him on his cuteness and he slept the entire time, safely snuggled up in his beloved Ergo. I'm pretty sure his "ouchies" hurt me more than they hurt him, but isn't that the way it always goes? 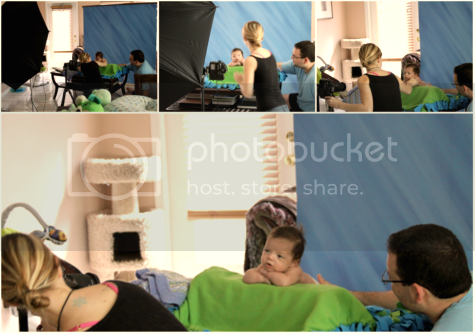 When I was contacted by Mixbook to create and review my own custom photo book, I was initially worried that it would take me days to create a photo book from start to finish, especially with a newborn at home. 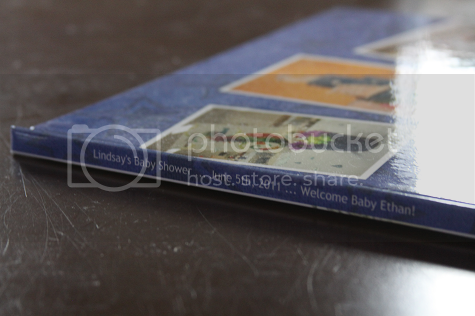 I decided to do a photo book with pictures from my baby shower as I hadn't printed those out at all considering Ethan's speedier than anticipated arrival and wanted to make sure that I ended up having an album to document those photos. 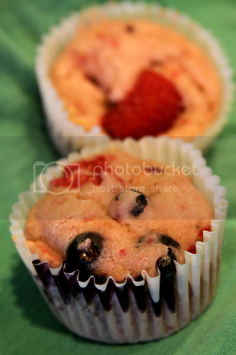 I was definitely impressed when I logged onto Mixbook's very user friendly website and saw that you don't have to upload the photos straight from your camera (which you can do still) but you can also grab pictures you previously uploaded to Flickr, Photobucket and even Facebook! Talk about a timesaver! I'd already uploaded my pictures to my Facebook album after my shower, so I chose that option. In just a couple of clicks, all of the photos copied from my Facebook album and into my Mixbook account. It was so simple! 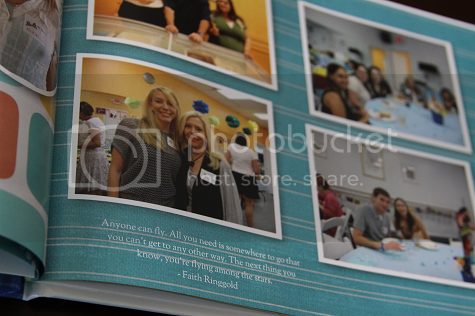 Right off the bat, I was so impressed that Mixbook offered the option to print text on the spine of the hardcover photo book that I was creating. We store our photo books under our coffee table for our guests to be able to view and unless you pull all of them out and look at the covers, you have no idea what they are. 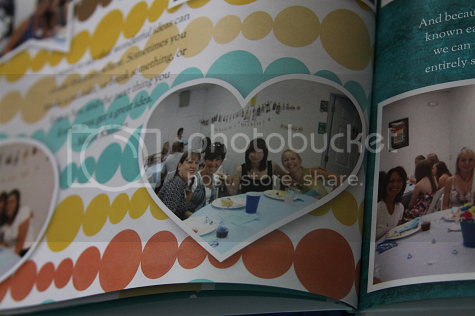 This was always something I hated about photo books. 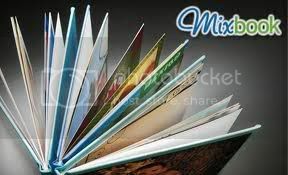 I was so excited to see that Mixbook offered the ability to print on the spine of the book. It was also pretty cool that I was able to pick a background and my own layout for the front and back covers of the book. That, too, was a feature I hadn't yet seen before and it really was great to add my own personal touches. 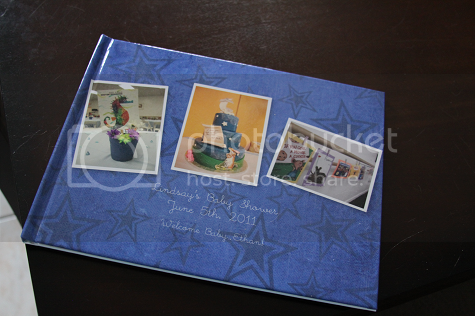 I've ordered photo books from other vendors in the past but I really liked the options Mixbook provided when selecting a layout or theme (there are tons to choose from) or you have the ability to design your own layout. Feeling kind of creative, I decided to design my own layout and see what Mixbook had to offer. There were so many backgrounds to choose from -- you could make each page as detailed or as simple as you wanted. What was even cooler was that you could upload your own background image! That was a feature I'd never seen before and used on my book to tie in my theme. Since my baby shower was children's book themed, I added text to some of my pages in the form of quotes from children's books or notable children's book authors. 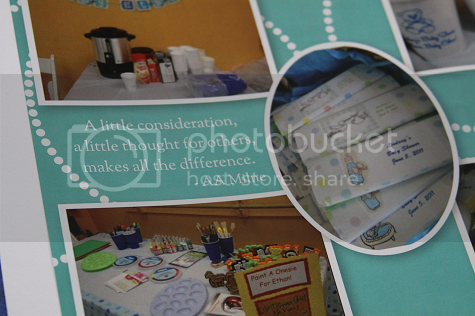 Mixbook gave many great options in terms of font and the finished product ended up being extremely clear and legible! Sometimes font can print a little bit blurry if you're altering the size too much but all of my fonts came out crystal clear! I decided to play around with the photos (which you can make bigger or smaller as you so desire to fit on your page) and found that you can make the frames in whatever shape you please, not just your standard rectangular frame. 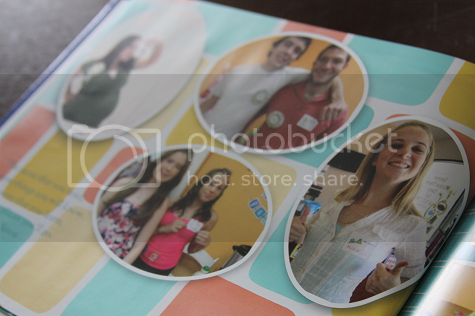 I was extremely pleased when my Mixbook photo book arrived in the mail. 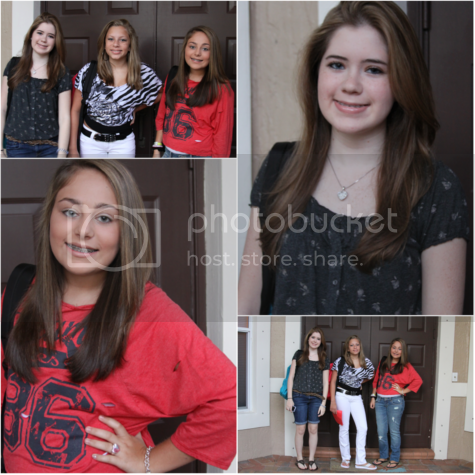 The quality of the photographs was flawless, as you can see (even though I stole them from my Facebook album!). 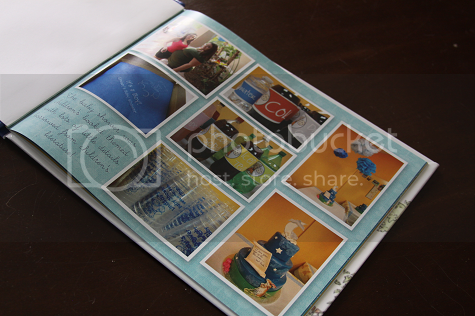 I liked that I was able to have so much creative freedom when creating the photo book (you can even choose a fun background and your own design for the cover!) and -- because I can't say it enough -- it is the coolest thing to be able to grab pictures you already uploaded previously. 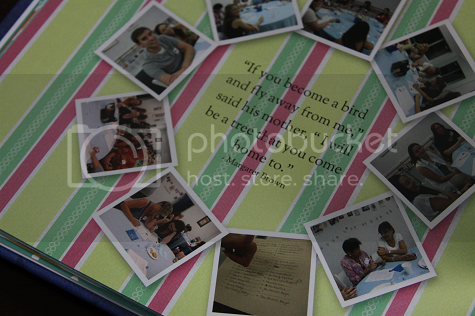 Because of that feature, I was able to design my photo book in no more than a half an hour. It's the time consuming nature of photo books, not to mention the usually pretty steep price if you want a high quality book, that always puts me off. Mixbook most definitely changed my opinion on photo books. Their prices are just as impressive as the services that they offer! All in all, Mixbook is an awesome company in all aspects. From their customer service to their products, they leave their customers totally impressed and pleased. I've already told several friends about Mixbook and will be using them for photo books in the future -- which will be often, since I'm pretty much a picture fiend if you haven't noticed! They also print cards and calendars, too! Their greatness doesn't just stop there. The wonderful people at Mixbook offered my readers a 20% discount and I get to offer my readers a chance to win their own free custom photo book! Exclusive 20% discount for You Are The Roots readers: To use your discount, visit Mixbook's website and enter the code YROOTS20 upon check out! Mixbook is offering one of my readers the chance to win a 20-page, 11x8.5 landscape, hardcover photo book with free US Domestic Ground shipping! Leave me a comment and tell me what you'd like to make a photo book of! Like Mixbook on Facebook and leave me a comment with your name (first name, last initial) or URL so this can be verified! 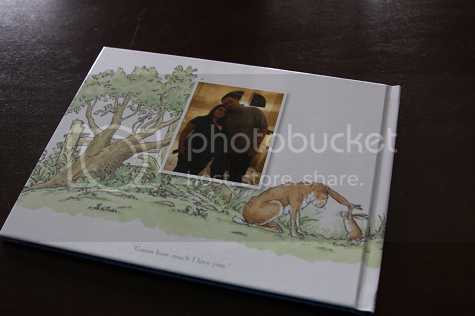 Leave Mixbook a Facebook comment and let them know you've entered the giveaway at YouAreTheRoots.com! Add Mixbook on Twitter and leave me a comment with your username so this can be verified. 3 Entries - Blog about this giveaway. Comment (one comment for each entry, 3 total) with a link to where I can find your blog entry. 2 Entries - Grab my button and comment (one comment for each entry, 2 total) with a link to where I can find it. Giveaway ends 9/7 and is open to US residents. Winner will be selected at random and notified via e-mail! 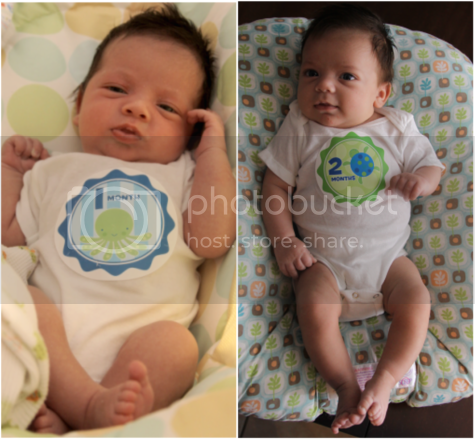 Yesterday Ethan turned two months old. Two months! The time has positively flown by and I am amazed at how he's grown. It seems like each day brings a new milestone or a new change in some way. These days, he's eating around 7 ounces per feeding. Sometimes he's feeling up to 8. He's eating at around 4 hour stretches during the day and 5-6 hour stretches at nighttime. He's holding his head up like a champion during tummy time and can even hold it up to look around when he's in the Ergo. Speaking of the Ergo, it's his absolute favorite thing in the world. I do 99% of everything while wearing him in the Ergo all day, every day. He's wearing 3-6 month clothing. His 0-3 month clothes don't come close to fitting anymore and his 3 month clothes are definitely way snug. He's wearing a size 2 for about a week now in his Seventh Generation diapers. He loves "talking" and "having conversations" with his mobile animals or us. He's awake so much more during the day and only has two real naps a day excluding the snoozing here and there he does (in the car or in the Ergo, mostly!). I'm loving how alert and focused he is these days. We have his two month check up (...and shots! I'm already crying whenever I think of it) coming up tomorrow. I'm eager to hear how much he has grown and how much he currently weighs...but I'm still begging someone to invent a way to pause time. It's exciting to watch him grow but also so very crazy! 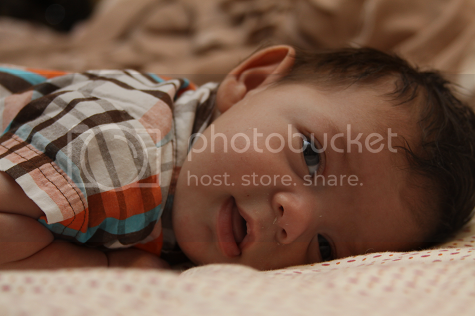 He isn't my newborn anymore and that boggles my mind! I've always thought the term "sisters" sounds trivial when I think of the way I feel about my own sister. On one hand, there is no bond more solidified and no bond that runs deeper than that of sisters. On the other hand, I was nearly 11 years old when my sister was born and so, in a sense, I've always felt more of a maternal bond in addition to that sisterly bond. In my eyes, she will always be my little curly-haired girl who looked up at me with her big blue eyes and turned me into a puddle. She will always be that little girl who auditioned for a talent show when she was just 7 years old with Blink 182's I Miss You while the other girls sang songs from Broadway musicals or children's television shows. She will always be the baby girl who would climb into my lap when I was a sad teenager (which, believe me, was often as I was admittedly the poster child of the "emo kid" generation) and ask me who she could beat up to make me feel better. She will always be the little girl who wrote an essay for her 5th grade class about her most prized possession being a book of photos of us that I made her before I left for college because if she's sad, she just had to look at them to feel happy again. She will always be the only girl who could possibly convince me to arrive four hours early to a dance competition and -- covered head to toe in eyelash glue and foundations in varying shades -- do the make-up for all of her fellow dancers. She will always be the girl who wears the other half of the friendship necklace I had made for her 14th birthday engraved with my favorite quote by Further Seems Forever: "...and I recall how you sat on the same side as me. It seemed you'd always be on my side. You're my best side." Today that little girl started high school. High school. High school isn't a place for little girls. I'm reluctant to realize that means she no longer is a little girl. It became all too clear to me that was the case when I sat there watching her and her friends do their own make-up, straighten their own hair. They no longer needed me to teach them how to blend eyeshadow or apply their lipgloss properly. My sister no longer called me and asked to borrow some of my make-up but, instead, pulled eyeshadow compacts out of her own seemingly never-ending cosmetic case. I had the privilege of watching Megan's friends grow up, too. So many of them have been in her life since nearly infancy and I've had the pleasure to experience first dance recitals, ice skating lessons, sleepovers. Watching these girls put on their backpacks and get ready to make their way to the high school where I graduated from? The eeriest feeling in the world. No longer will I walk into the playroom and find them playing with stuffed animals and ask them if they want to go swimming and order pizza. No longer will they ask me to flat-iron their hair or ask me to take them to ride ponies at Tradewinds Park. Those days, I'm realizing, are gone. My little girls? They're all grown up. Somehow they've become striking young women overnight. Young women about to venture into high school and walk those same halls that I walked during my transformation from child to young adult. They no longer need my help turning on the computer to put on Disney's "Toon Town" game. They no longer need my help officiating the weddings for their Webkinz. They no longer really need me for much of anything, except maybe giving them the heads up on which classes and teachers to both take and avoid in high school. In high school. I will undoubtedly be filled with a sense of nostalgia for the rest of the day but also a sense of pride. My sister may be growing up faster than my mind can possibly comprehend, but she's also growing up to be a beautiful and strong young woman. My dearest Megan, from Max & Ruby to reality television, from Blue's Clues Live to 99 JAMZ, from Mark Hoppus to Marshall Mathers -- and for both everything in between and to come, I love you to the stars and back. You gave me a bonus round to tack onto my childhood once it was over. Thank you for the life you breathed into me and the zest for living that I know you will bring to Ethan's childhood, too. I will always love you and be here for you. I will always be the Daria to your Quinn. Just one of the (many) perks of living in South Florida would be our easy access to the Everglades. Ever since I was little, my dad would take me on drives out to the Everglades to watch the animals and bond with nature. We'd read My Big Backyard or Ranger Rick magazines and then go see how many species of plants, birds and animals we could recognize. This was a tradition that never ended, only evolved a bit. These days, my dad and I grab Starbucks in the early morning and then go for a drive through the Everglades and see what creatures we can see as the animals begin their day. Although he's still too little to be exposed to crowds and venture into Starbucks just yet, we took him on his first drive through the Everglades this morning. 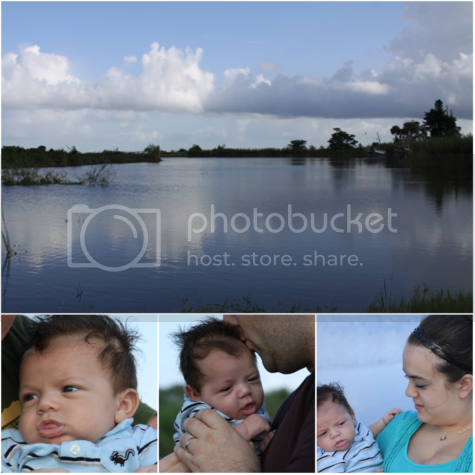 It was a perfect, breezy 74 degrees so we were able to get out of the car, breathe in the fresh air and let Ethan enjoy nature. 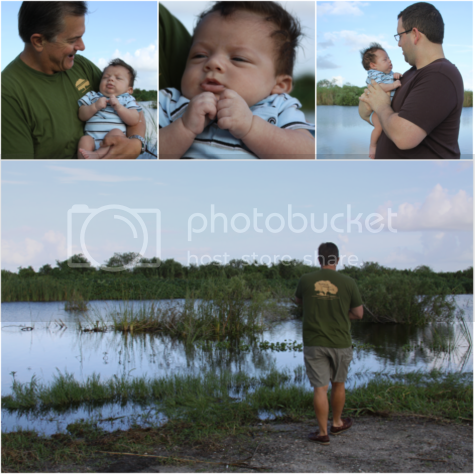 While I know he'll appreciate the turkey buzzards, alligators and the all-around complacency of nature much more when he's a bit older, it was still a memorable outing and one to be written down in his baby book. I've been admittedly (extremely) eager to bring Ethan in on this tradition since the moment I found out I was pregnant. There's no feeling more special than watching your child share your most beloved childhood memories as their own, especially when it means seeing my own parents as grandparents. I know it's only a matter of time before he's begging his grandpa to make one more lap around the gravel roads so he can count the gators in the brush or surprising us all with his knowledge of herons and waterbirds. Here's to making memories on wonderful and relaxing lazy Sundays!